We try hard to keep shipping costs low. 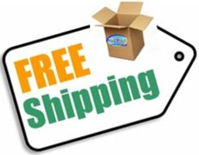 We have low standard shipping and free shipping for qualified orders over $100 for your convenience. This code will give you free shipping on all qualifying products totaling $100 or more in your shopping cart.